Our gourmet cakes are baked by hand with the purest ingredients and are welcome at any table. 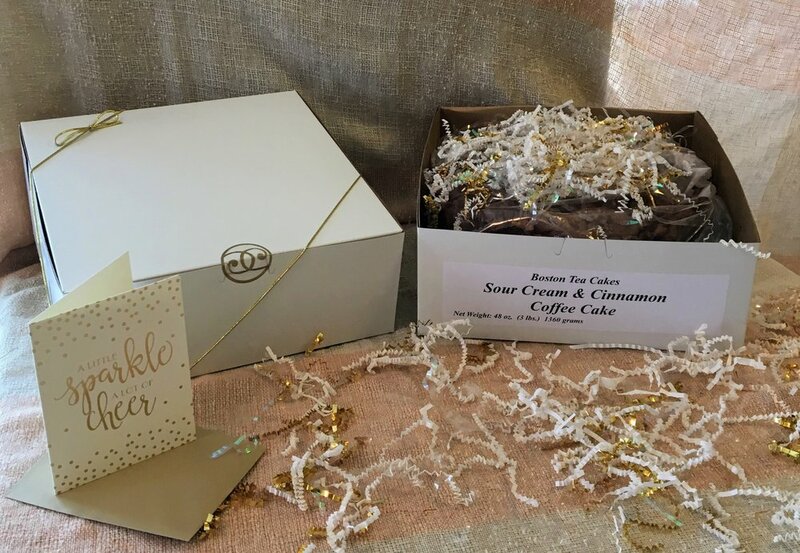 It is packaged in our signature bakery style box, which is also decorated with metallic shred or confetti. A handwritten card is enclosed with your personal message. All cakes are delivered either by UPS or Priority Mail within two to five business days** after the order is processed. When placing the order under notes please indicate when you would like the cake to be received. For expedited shipping please contact us directly for estimate of additional charges. We ship our large sized cakes (over 3lbs. each) which serve 16 or small size cakes (1 ½ lbs.) which serve 8-10. You’ll enjoy excellent shelf life at room temperature. Traditional Sour Cream & Cinnamon with walnuts are 18-21 days, Apple Cinnamon, Blueberry, Chocolate Ecstasy, Cranberry Cream, Lotsa Lemon and Pumpkin Cream are 10 days. Keep refrigerated and they’ll last several days longer. You may freeze and refreeze. * An additional shipping charge of $2-8 dollars maybe added for cakes being shipped beyond the New England States. ** During holiday weeks, please allow an additional two-three days for processing and delivery.